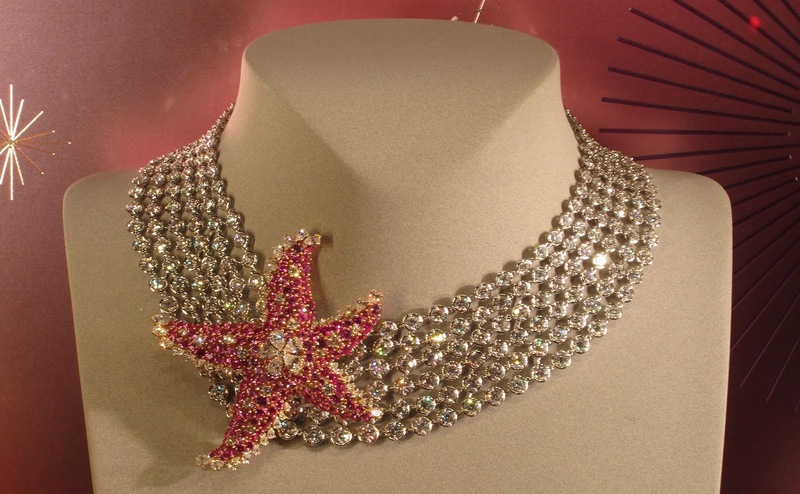 A “Palmyre” diamond necklace with an attached starfish clip from the “Seven Seas” collection. Wow! 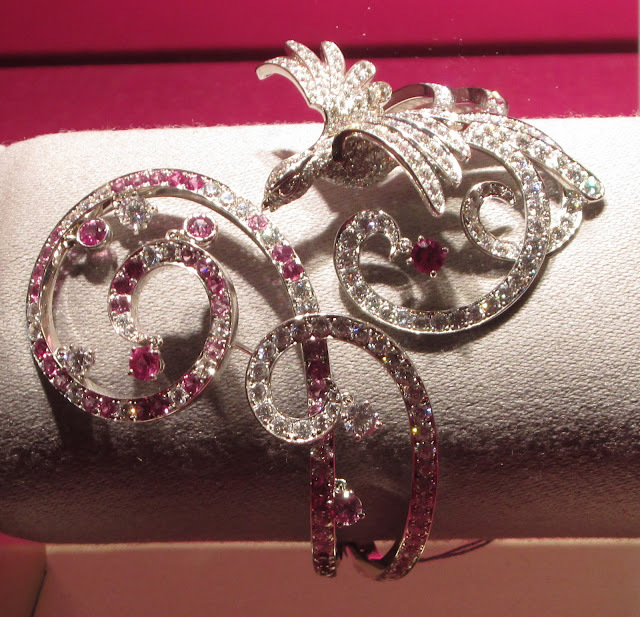 After a visit to the newly renovated and gorgeous jewelry salon at Bergdorf Goodman—see it if you can, it is so glamorous and luxe inside, all pale gray with touches of silver and gold and beautiful chandeliers!—my mother and I stopped to admire the gems in the Van Cleef & Arpels windows next door. You used to be able to enter VCA right from Bergdorf but that is over, they built up a wall during the renovation between the two stores so you will have to leave one to enter the other, even though they are in the same building. It was close to closing on a Saturday night when we were there so some of the windows were partially turned out—it was interesting to see that the cases contain a kind of Lazy Susan cabinet that allows the merchandiser to turn the displays out at the end of the day in order to retrieve the jewelry. 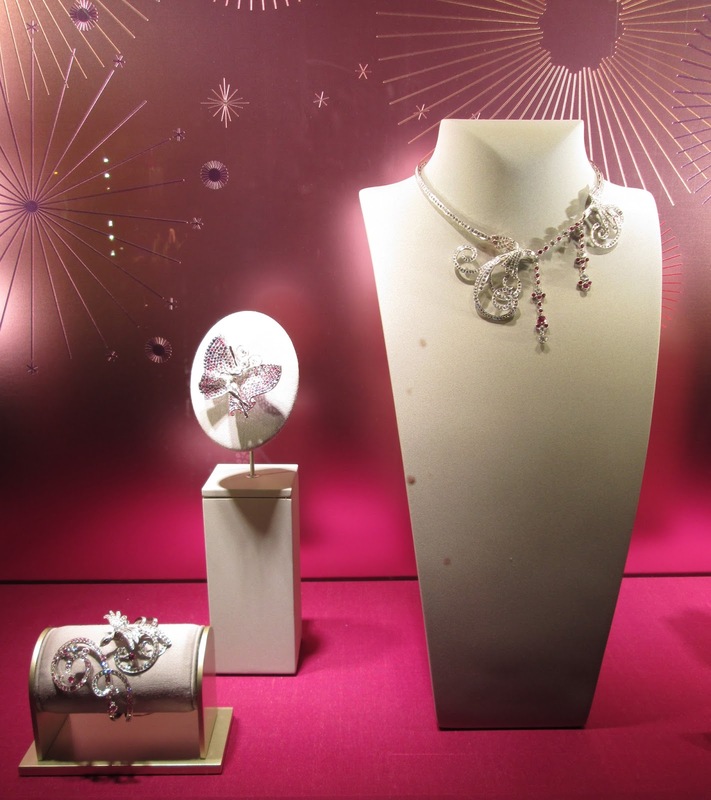 Unlike Tiffany & Co. across the street, Van Cleef & Arpels does not leave their jewelry in the windows overnight. It’s too bad, though I do understand. Love the jewelry, love the displays! 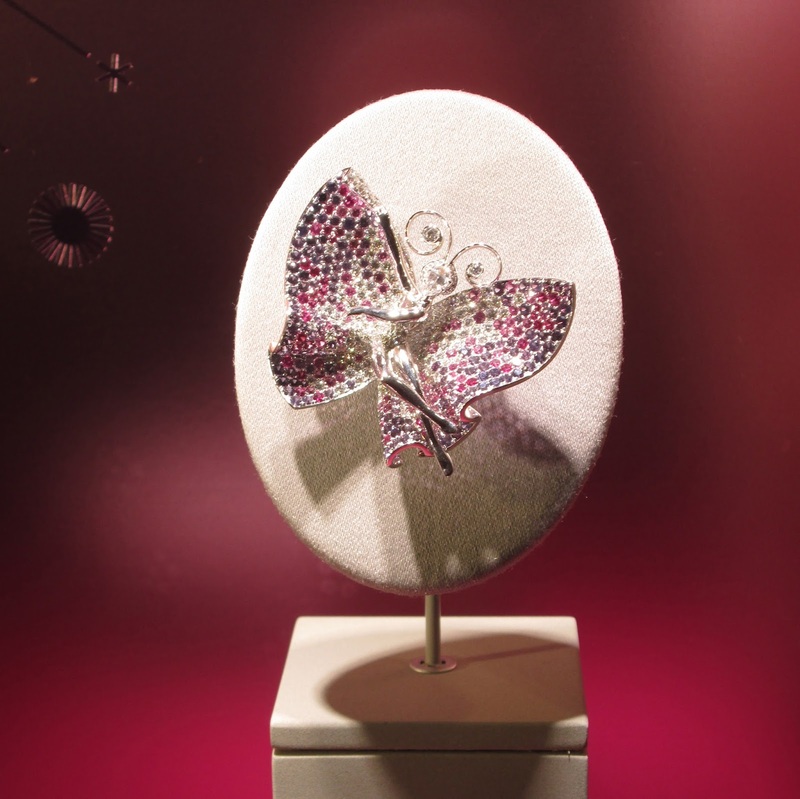 As ever, to gaze into the windows at Van Cleef & Arpels is to look into a dream and it’s one I never want to wake up from! I do love to see the colored stones they use and the workmanship too. These windows were particularly wonderful to me since they featured backgrounds of deep pink and lavender, with gold and metallic pastel starburst designs that always make me think of the 1950s and 60s. 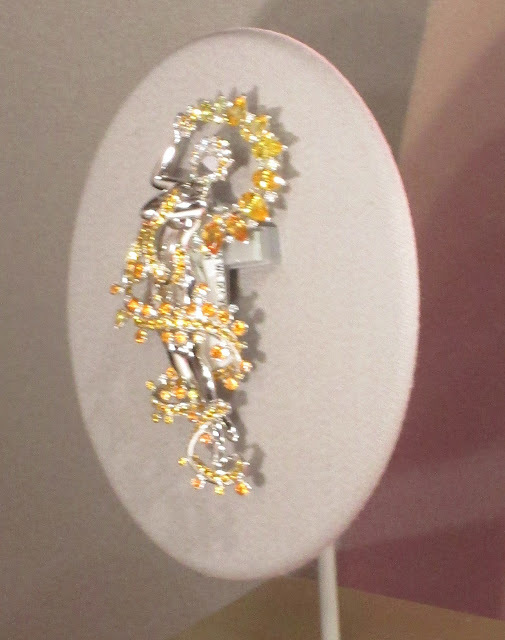 Another of Van Cleef & Arpels’ amazing clips. Love the bird detail and all that pink! Sapphires, I think, but tell me if I am wrong, gem experts! 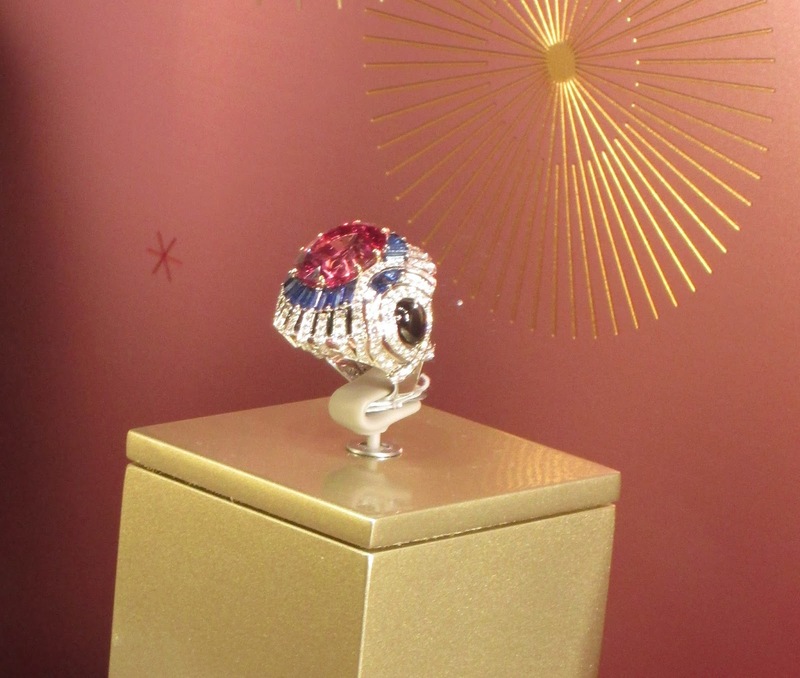 I love diamonds as much as the next gal but I tell you, I really do feel a stronger pull toward colored gemstones and the ring below, which features a ruby nestled in diamonds, is now my new favorite thing ever in a Van Cleef & Arpels window. This is the ring of my dreams! 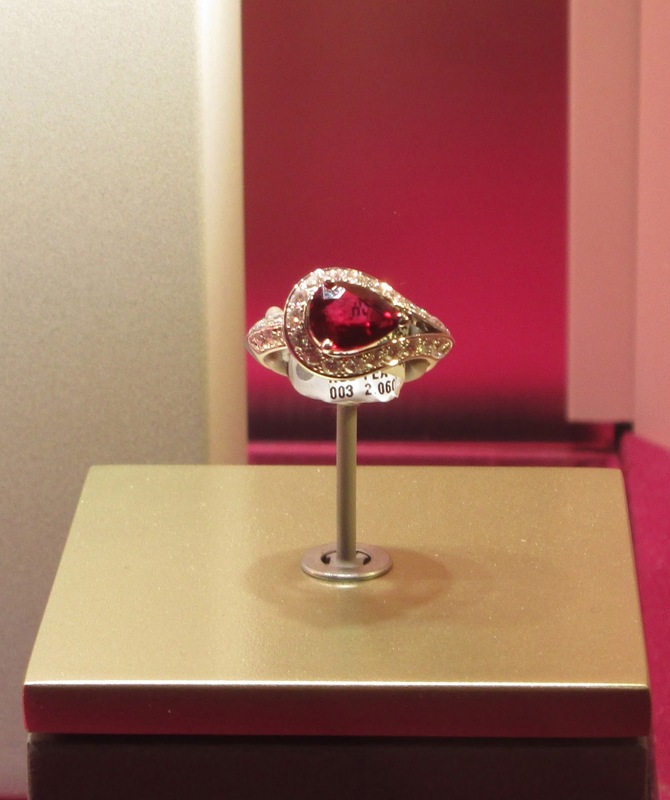 Heart-stopping ring of ruby (I think) and diamonds. 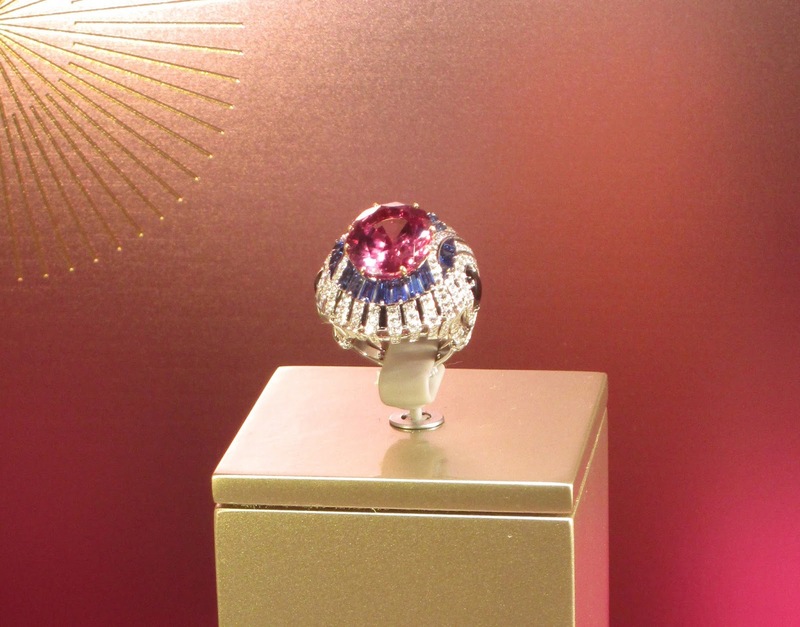 Another ring I loved was the multi-stone (and huge) ring of sapphires (pink and blue), diamonds, and onyx, shown below. Wouldn’t it be fun to wear this to a swanky party and swill champagne! No one would be able to take their eyes from your hand! Now that is my idea of a cocktail ring! The side of the ring. I would love to try this on! This window was about to be put away for the night. I wish this shot had come out clearer to show this beautiful clip. 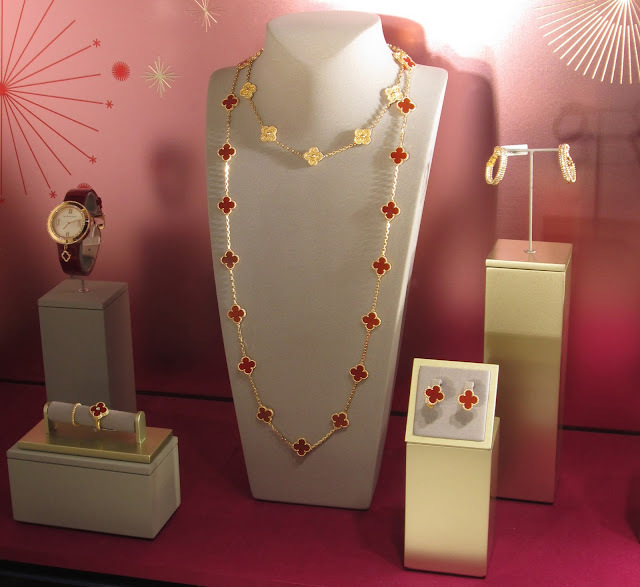 I also enjoyed the window on the 57th Street side of the store that featured more every day pieces, like the Vintage Alhambra necklaces, earrings and ring. I would not say no to a 10-motif necklace! A window devoted to more wearable everyday pieces. I love these two necklaces layered together. 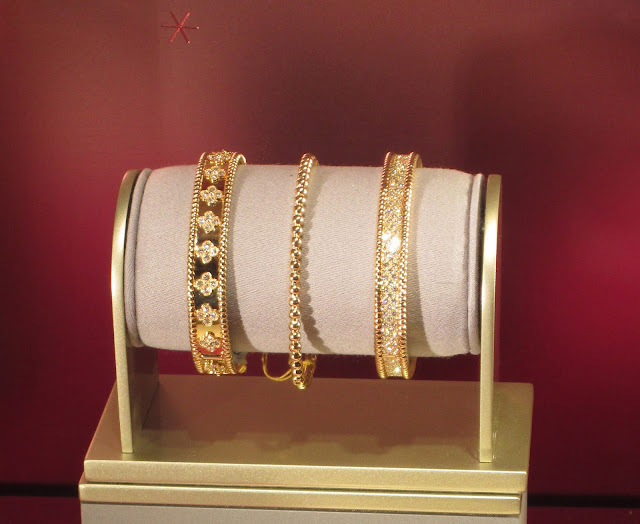 Bangles of gold and pavé diamonds. Let me know what you’d pick from this feast of Van Cleef & Arpels jewelry if you could choose just one thing! My selection would definitely be the ruby and diamond ring. I would love to hear your top pick! The multi-strand diamond necklace with the starfish pin. I think I have enough personality to pull it off. If not, I'll develop some. It would be worth it! No hesitation here. It would definitely be the ruby & diamond ring. Beyond stunning. It looks like VC&A used a pear shape ruby set sideways surrounded by diamonds. I will try to get to the VC&A window & Bergdorf's when I get back for Easter. I love that ruby ring! If I didn't already have one I would be begging my husband for this one. 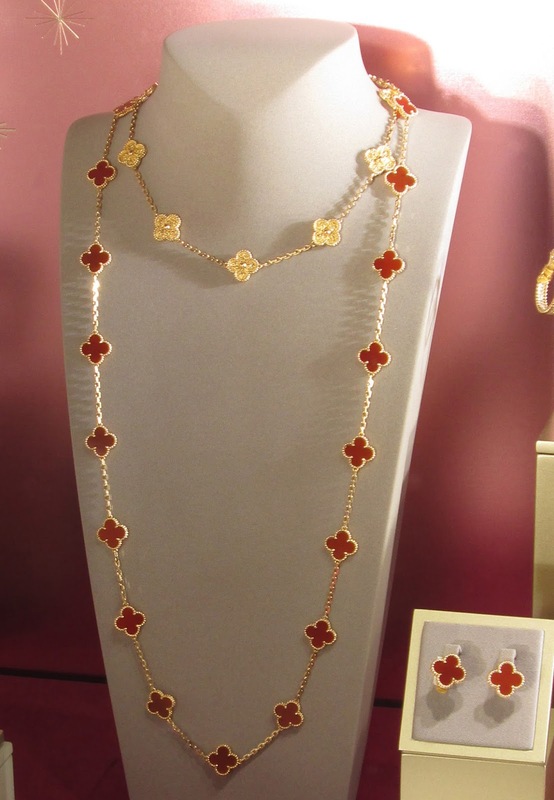 One of our neighbours is a diamond cutter and he makes jewellery for V&C. I'm going to show him the your photo and see what I can find out about it. That Starfish...stunning! What a beautiful piece! I just came back for another look, as I passed by the VCA in Rome today; but didn't have my camera. I'll try to get by there tomorrow and take some photos of the windows. I do remember they had a similar diamond collar necklace in the window. What a beautiful display. I can only imagine what it must look like in person. My pick would be the butterfly clip. Thank you for sharing these 'gems' on the Powers the Flower link-up. I always have a weakness for their jewelry. I remember going into the store not knowing how expensive the Alhambra necklace was on tried it on. When I asked the price, I almost choked and said that I will let my husband know and come back for it.